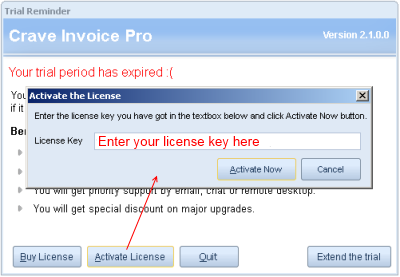 Activation: Once your trial period is expired, you will need to put in the license key on the trial dialog to continue using the software. The license activation requires Internet access. So you will have to make sure that Internet is available and firewall / security software on your computer is not blocking its access to the software. Deactivation: The license is bound to a computer. So once you install it on one PC, you will not be able to shift or transfer it to another PC unless the license is deactivated from current PC. You can deactivate license from the Help menu -> Deactivate license command. The deactivation also requires Internet access. Move or Shift license to another computer: If your current computer is crashed, stolen or not in a position to work then you can install the software to another computer. But unless it is deactivated as stated above, it is not possible to activate license again. For this, you will have to contact us by e-mail with your license key so that we can deactivate license from our server. We have to do this since you haven't got the chance to deactivate the license from your computer. Old version over new version: If you lost the setup file after your old computer is not able to work and if you have downloaded the setup from our website then your database backup might not work with the new installation because of the version difference. You will need the correct version to be installed on your computer matching with your database backup file. If you know the correct version (e.g. 1.8.1.0) then you can contact us so that we will provide you the setup file.